When coal is burned, two major forms of ash are produced. The fly ash is light and leaves the furnace with hot gases. The bottom ash is heavy and stays in the furnace until it is scraped out. Due to potential liability issues and/or the need to find new real estate at power plants for expansion, many utilities must replace their traditional coal ash ponds. Utilities using traditional hydro bins can accomplish this by installing a system using solids contact clarifiers and dewatering equipment. In addition, ash ponds have been used in power plants to handle the many and varied waste streams which are produced. The use of a mixed equalization tank produces a somewhat uniform influent stream which can be processed by the solids contact clarifiers. Hydro bins coupled with gravity sedimentation are used to recover most of the water from the bottom ash handling system. The solids contact clarifier uses a sludge bed and recycling of the solids internally to build up and maintain an internal solids concentration which removes fine materials. The addition of lime slurry to this stream can also remove any oils and/or heavy metals which may cause problems for discharging the stream. This system with lime addition can process the many and varied plant waste streams which are traditionally sent to the bottom ash pond. Since the solids contact clarifier has an internal recycle stream which is approximately 10 times the maximum influent flow and hundreds of times more solids than the influent stream, it can absorb the variations produced by the influent streams, including amount of solids and temperature. If the pH is raised above 11, there will be precipitation of heavy metals in the hydroxide form. This water must then be neutralized. Water from the system can be recycled to the bottom ash handling system or used in other parts of the plant, such as cooling tower makeup, wash down water, or dust control. The sludge from the solids contact clarifier is sent to a thickener. By removing excess water at this stage in the process, it allows the dewatering equipment to be smaller and more economical. In this process, with the addition of lime, the sludge would enter the thickener at approximately 3–5% solids and be thickened to > 10% solids. The thickener can also be sized and used to handle other sludges produced in the power plant if it is desirable that those sludges would be dewatered also. The lime in this sludge will aid in the thickening of other sludges which otherwise might not thicken. The lime will also help these combined sludges be in such a consistency that they will dewater well. Belt presses are used in the dewatering step. The belt press uses two parallel cloth belts pressed between a series of rollers to squeeze the moisture from the solids. Belt presses offer the advantage of continuous operation and minimum operator attention. Once the chemical addition has been adjusted, the dewatering process can be monitored from the control room by means of closed-circuit television. Other options for dewatering include filter presses. In either case, lime sludges tend to dewater well and produce relatively dry cakes. The water from the dewatering step is returned to the clarifier for retreatment through the system. Need a fast and efficient solution for ash ponds? Our mobile units can be on site at your location within days. They’re available for lease, so you can contract them for only as long as you need. WesTech offers mobile RapiSand units, pressure filters, ultrafiltration, and chemical feed equipment, as well as operations services. 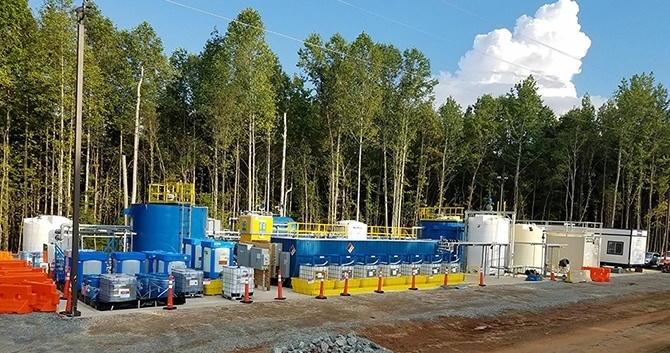 If this sounds like a service that would benefit your project, visit our special section about wastewater solutions for coal-fired power plants and submit a request for more information. For a list of power-industry-related equipment that isn't part of our mobile fleet, see the Related Products section below. In the wake of dike failures on retention ponds and in the face of new legislation, many coal-fired power plants are opting to eliminate all coal ash ponds. These ponds are mainly for the storage of coal combustion residuals which include gypsum, fly ash, and bottom ash. This process is further complicated by the fact that pending EPA classification may deem fly ash and bottom ash as hazardous materials. Therefore, some utilities have opted to keep their non-toxic gypsum streams and potentially toxic coal ash streams isolated from one another. This strategy also makes sense if one is going to sell the dewatered gypsum to the wallboard market. The first step in this process is to send the gypsum stream to a bank of hydrocyclones. Here the solids are separated by means of centrifugal force. The hydrocyclone underflow containing the majority of the solids flows to the sludge mixing tank. The hydrocyclone overflow goes to the thickeners. If this were not done, the percent solids in the thickener underflow would be too great to pump the sludge to the belt filters. Removal of these solids and associated liquid also allows the thickeners to be smaller in diameter, saving valuable real estate and reducing capital expenses. The thickeners receive the overflow from the hydrocyclones as well as the filtrate returned from the horizontal vacuum belt filters. Polymer is added to facilitate thickening in addition to caustic if pH adjustment if required. The sludge is pumped to the sludge mix tank and combined with the underflow from the hydrocyclones. In this application, the thickeners have a dual role of not only settling and thickening solids, but also of clarifying the wastewater stream prior to its discharge. The solids level in this stream must meet the discharge limits of the power plant. This treatment process does not remove heavy metals. The combined gypsum sludge streams are mixed and then sent to horizontal vacuum belt filters. Typically gypsum for disposal has a moisture level of 15%. Gypsum for wallboard use has a final moisture level of less than 10%. The filtrate from this dewatering step is returned to the thickeners. Due to the concern for cross-contamination of either the liquid streams or the residual solids, the ash streams are kept separate from the gypsum stream. The nature and amount of stream solids do not require hydrocyclone treatment, so thickeners are the first step in the ash handling system. 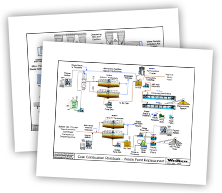 Polymer addition promotes solids settling and creates a liquid stream suitable for recycling to the ash handling system. The nature of the ash solids allows dewatering by rotary vacuum drum filters. This saves in capital and installation costs as well as the installation area required. This processed ash contains approximately 15% moisture. It is suitable for sale or landfill disposal. Pile runoff basins have historically been used for the removal of suspended solids (coal fines) prior to discharge to wastewater streams. However, it was soon found that other contaminants were in this waste stream. Sulfur compounds contained in coal were oxidized by rainwater and produced sulfuric acid. This is analogous to the production of “acid rain” drainage from mine tailings. Water tinged with sulfuric acid leached other impurities from the coal, producing an acidic runoff contaminated with heavy metals. The desire to eliminate all types of basins and ponds has prompted the industry to use more refined treatment systems. Acidic streams containing iron, aluminum, and sulfate are treated for removal of these contaminants. Another driver for segregating and treating this stream is ever-decreasing mercury limits. These limits make it desirable to treat the stream prior to comingling with more conventional wastewater streams. Wastewater characteristics change with rain events. Streams start out highly acidic but dilute with added rain. Dissolved metal levels also decrease the longer it rains. Some heavy metals are removed as hydroxides by raising the pH. The pH is raised by adding chemicals, typically lime or caustic. Since the waste stream flow rate is small, pH adjustment is usually accomplished through caustic addition rather than lime slurry. For heavy metals effluent requirements that cannot be met by precipitating the metals as hydroxides, sulfide can be added in addition to the pH adjustment. Metal sulfides have lower solubility than metal hydroxides. In these cases, organosulfides or sodium sulfides dosed into the stream precipitate as heavy metal sulfides. These compounds effectively remove mercury down to parts per trillion levels. The addition of ferric chloride neutralizes charged particles, promoting flocculation and enhancing clarifier performance. Ferric chloride also precipitates mercury and organic matter. Polymer addition yields larger flocs, further enhancing clarifier performance. The wastewater is clarified by a CONTRAFAST® Clarifier Clarifier, while pH is normalized with hydrochloric acid. Raw water, recirculated sludge, and treatment chemicals enter the center draft tube. They are mixed and recirculated within the reactor by a variable speed impeller. The impeller accelerates solids formation and densification. A high-velocity upflow port prevents settling and moves water to the settling chamber. The water passes under a baffle then upward through settling tubes and into the effluent collection launder. Dense sludge settles to the basin floor where it is continually scraped and further thickened prior to removal. Gravity filtration may be used to achieve even lower suspended solid levels prior to water discharge. In this case, filter backwash is returned to the front of the wastewater treatment system. Thickened CONTRAFAST® solids are dewatered with recessed chamber filter presses or belt presses without the need for a separate thickening unit. Press choice is determined by sludge volume.